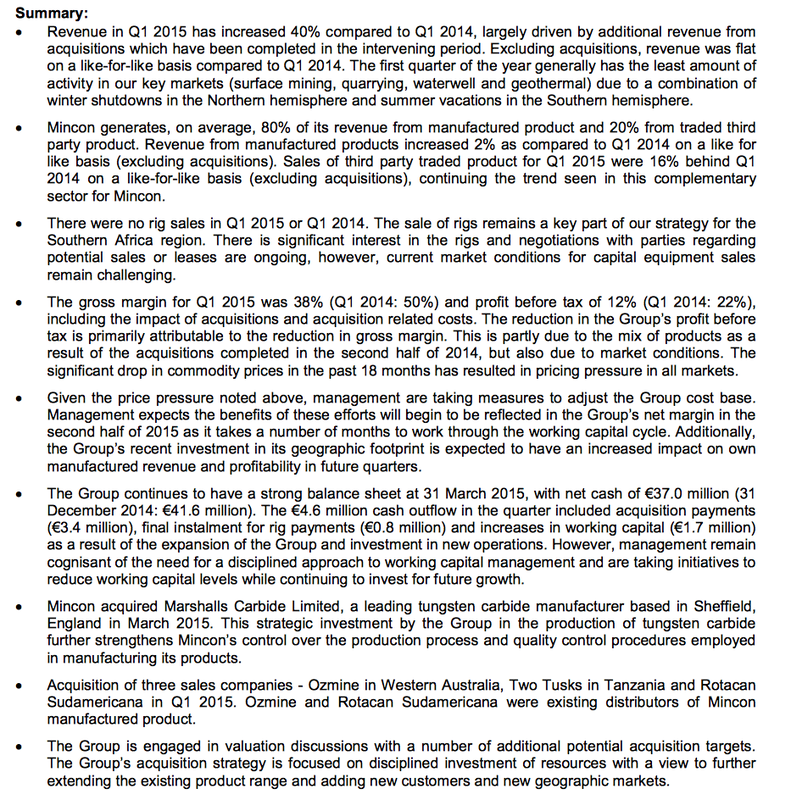 Maynard Paton | Mincon: Have Q1 Profits Just Slumped 24%? * Q1 revenue better than expected? MCON reported its Q1 revenue had improved by 40% largely due to acquisitions undertaken during the second half of last year. For 2014 as a whole, those acquisitions would have added an extra €15m to MCON’s revenue — equivalent to a 33% advance. As such, the 40% improvement for Q1 2015 may have been better than expected. I wonder if foreign-exchange movements have had an effect here. You see, many of MCON’s customers purchase in US dollars or South African rand, both of which have strengthened recently against MCON’s Euro reporting currency. I was pleased MCON could confirm underlying revenue from its own products had managed to increase by 2% during the quarter. * But have Q1 profits just dropped 24%? I was disappointed to see MCON admit its pre-tax margins had slumped from 22% to a rather ordinary 12% during the quarter. The group cited product mix, acquisitions and “pricing pressure in all markets” for the shortfall. My sums indicate a combination of revenue up 40% and margins falling from 22% to 12% would leave overall profits down 24% on the prior year’s Q1. Not great. At least MCON’s management is “taking measures to adjust the cost base”, the benefits of which should filter through to margins during the second half of 2015. What’s more, MCON revealed Q1 is traditionally the quietest of its quarters, so I’m hopeful the scale of the profit fall won’t be repeated during the rest of the year. I was surprised to read MCON’s net cash position had shrunk by €4.6m to €37.0m during the quarter. The group cited acquisition payments, rig payments and working-capital increases had cost a total of €5.9m, which suggests Q1 post-tax profits may have been around the €1.3m mark. For some perspective, average quarterly profits last year were €2.3m. I’m guessing (and hoping) the slightly depressed net cash position may be due in part to the timing of certain cash-flow items, and that better cash generation will occur later in the year. We’ll just have to see. “Management remains cognisant of the need for a disciplined approach to working-capital management and is taking initiatives to reduce working-capital levels while continuing to invest for future growth”. I noted in April that it can take MCON nine months to transform one of its drills from raw material to sold product. This Q1 statement sadly did not divulge enough information for me to construct a completely fresh valuation projection. But even assuming 2014 profits can be repeated during 2015 — unlikely I feel after this update — the current £1:€1.41 exchange rate equates to possible earnings of 2.9p per share and net cash of 12.5p per share. On that basis, the share price needs to be 41p to match my initial MCON purchase valuation and give an enterprise value of 10.